Hey there. Do you live in the North Seattle area and have an interest in sneaking out of the office a little early on Monday? I’m meeting up with the excellent food and garden blogger Erica from Northwest Edible Life tomorrow, and we figured hey, we should invite YOU too! A mingling of both blog readerships, with your favorite bloggers as informal hosts. The somewhat male-dominated group of Financially Sharp Badasses known as the Mustachians, and the Nutritionally and Politically Aware Ultrachefs of Northwest Edible, who I’m guessing are not quite as likely to be dudes who work in high-tech or medicine. Will sparks fly? What kind of party will ensue? Where? Elliott Bay Brewing Company on Lake City Way in North Seattle. Map and directions here. How Much? 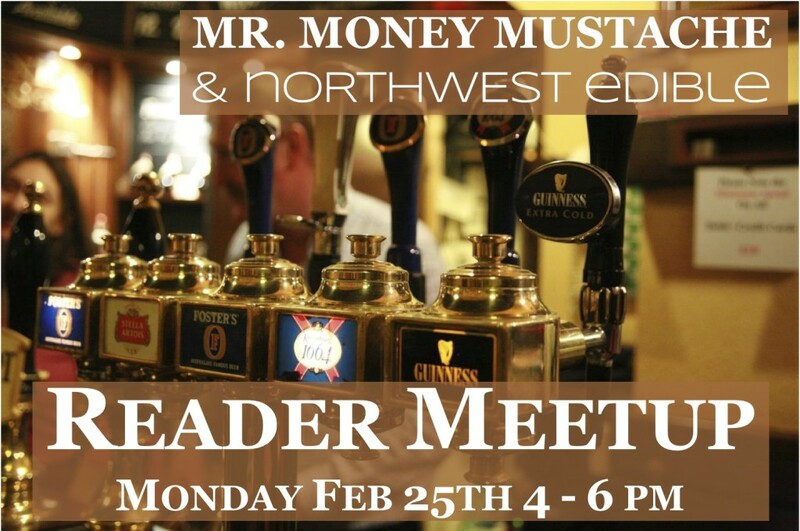 The Meetup is free, but do plan on ordering a drink or a bite to eat or something so the good servers at the restaurant aren’t running around filling up water glasses for no pay for two hours. Transportation & Parking? Elliott Bay Brewing has a parking lot. Carpooling is encouraged, and bike or bus riding is even better. This venue is only about a mile off the Burke-Gilman bike path. RSVP: It would be fantastic to be able to give the pub a rough idea of how many people are showing up. So, if you know you are coming, leave a comment here saying so. If you didn’t RSVP but are able to come at the last minute, just show up! Don’t let a lack of RSVP’ing keep you away. Special Offer: First 10 Mustachians to show up on a BIKE get their first beer on me. Show your stuff by arriving in a non-car-way and be a hero!! This post and the graphic heavily cribbed from Erica’s original invitation. Sounds fun! A bit of a trek from NZ though! Another jealous NZ’er….come to New Zealand! You already live in paradise. No need to come to Seattle. Maybe you can entice MMM with a project in NZ and some Queenstown skiing. Now you’re talkin! I often fantasize about skipping the whole short-days season by transplanting to New Zealand in the Northern hemisphere’s fall.. and spending the “winter” way down in Christchurch or Queenstown where it is light until 9PM while Colorado gets dark at 5:30. I’m a new reader and stumbled across this post. I’m down near Queenstown…come visit anytime! I know, right?! I’ve been looking at real estate in Nelson/Tasman with a big “I wonder if MMM would like to rebuild this with us…” thought bubble above my head! I’m reading through from the beginning of time and I’m going to be so disappointed if they’ve been already and I missed it! Close to my old stomping grounds! Wish I could be there! When’s the MMM roadshow coming to NY? How about nutritionally and politically aware NWE and MMM readin’ chicks, who happen to work in technology? Take that, target demographic! ;) See you there! You have company, sister! Unless something major comes up at work today I will be there too. And what about urban-homesteading, chicken-raising NWE and MMM readin’ tech-worker dudes? I DEMAND to be taken seriously!!! I’ll be there! Wouldn’t miss it. I doubt I can make it today, but perhaps we Seattlite techie-frugies (sorry, could not resist making a silly word) can organize a local meetup?Would love to meet similarly inclined folks. Darn, too far away for us Brits to attend! Well, maybe if we found ourselves a tandem and shared cycling duties???? I think it is great that you are getting out and meeting your readership. How about a more local meet and greet in the near future for your readers that live just a few minutes from you? Boulder has lots of options for great food and beer (no offense whatsoever to the great town of Longmont :) Just a thought. I’ll be there if I can convince my boy to ride up there with me. Also, a reminder to the locals – Mondays are half-off growler nights. Enjoy yummy beer all week for 6 bucks, so bring your jugs! Very tempting, as I am in the Portland metro area, and Seattle isn’t THAT far away. But alas, I won’t be driving that far, the Amtrak special rate needs a 2 week pre-purchase, and it is about a 19 hour bike ride from here! I did that whole Seattle-to-Portland thing one year… You can totally make it in 17.5 hours! Great times there last night MMM. Enjoy all the Pow up in them-thar-hills of the North Cascades. Count me in! Sadly, I’ll have to bring myself in my anti-moustachian vehicle… I’m new at this…! But having MMM in my beautiful city is too good to miss! Aw, man! When is everyone going to come south to Portland? Road trip!! Wish I could make it but I will be unable to pull away from work today. Enjoy the brews! Hey, this is right up the street from me! I can make it for the first hour. These two topics are great for a meetup mashup. See you there. Are MMM readers really mostly dudes in tech or medicine? I am none of the above. Has anyone conducted a reader poll on this? Count us in for two. Looking forward to meeting you both!! This is my RSVP: I’ll see you there. I’VE DONE IT!!! After discovering this blog just over a month ago, I’m finally caught up. My girlfriend will be happy to have me back after reading for an hour each night after work. That being said; not sure she’s the biggest fan of The Mustachian Lifestyle. A bit unrelated, but I had to share the article I was reading today on CNN Money. Idiots again are using phrases like “debt isn’t always a bad thing” and “why less debt among young adults is bad news”. Bank sponsored article no doubt. yeah, weird article….if job prospects for these young adults were fantastic then taking on debt MIGHT be logical or acceptable….in this economy it is irresponsible and so these young adults are behaving in a logical and responsible way by renting and not getting further into debt….am I missing something…???? wonder who buys the ads in Money magazine these days??? Hope you will come to Bellingham and board at the only real mountain in Washington, Mt. Baker!! wish I could but it’s a bit far from Melbourne Australia. enjoy. would love to be there (Brooklyn is out of biking range I am sure) and the turnout looks to be good… have fun ya’ll. I sure LOVE Seattle- one of the prettiest places in the world! Have a great time- wish I could come! Thanks for the beer, and have fun in all the powder! Great meeting MMM, Erika, and everyone else! Too many people to talk to them all. Let’s do it again, Seattleites! I do live in North Seattle and have an interest in sneaking out of the office early on a Monday! I’m sorry I didn’t see this in time to come to the meet up. I hope you will do it again if you come into town again next year. Shame I didn’t know about your fantastic blog at the time as I live in the Seattle area. discussing food, frugality, and life, all while enjoying a fine NW microbrew. Sounds great to me!